Japu Deru gives Cash award to students of hid constituency who cleared APPCS prelims examination. Japu Deru , the Advisor to Chief Minister and local MLA of 7th Bomdila Nafra Assembly constituency has given cash prize of fifty thousand with small statue of Buddha to 8 candidates who cleared APPCS prelims examination. Those candidates who had cleared APPCS prelims examination and got award from Japu Deru are are Sanju Yangchung, Tsering Yangchung , Miss Naina Jangju , Tenzin Guk Khangroeju , Sange Tsering , Passang Tsering Sarchokpa , Tenzin Phuntsok Thakuri and koncho Tsering. 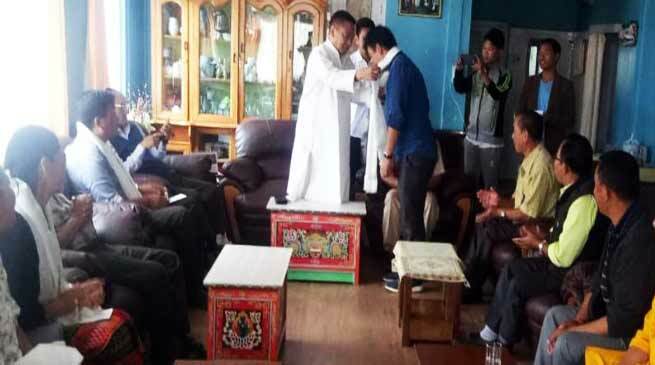 Beside that fifty thousand cash prize with small statue awarded to Vinite Zongluju and Phurpa Tsering for clearing MBBS and UPSC examination from his constituency. Japu Deru on his speech encourage to the candidate for appearing examinations of APPCS. Further he advice to the youth of west kameng district to study hard and achieve goals like Phurpa Tsering had did in UPSC examination. Tawang- Dalai Lama's Speech on "Secular Ethics and Happiness"